Investment banking—doing deals with business owners—deeply and immediately changes the lives of individuals, businesses and communities. The nature of the work drives social, macro-level change. That’s one reason it is such an exciting and rewarding field. Social impact can mean many things, but it is nothing less than taking care of your community. In my context as an investment banker, taking care of my community is finding and combining the right people, the right capital and the right company. Social impact investment banking is not dealmaking for dealmaking’s sake. Social impact investment banking is dealmaking to honor the legacy of the exiting owner and to create long-term value for the new owner. 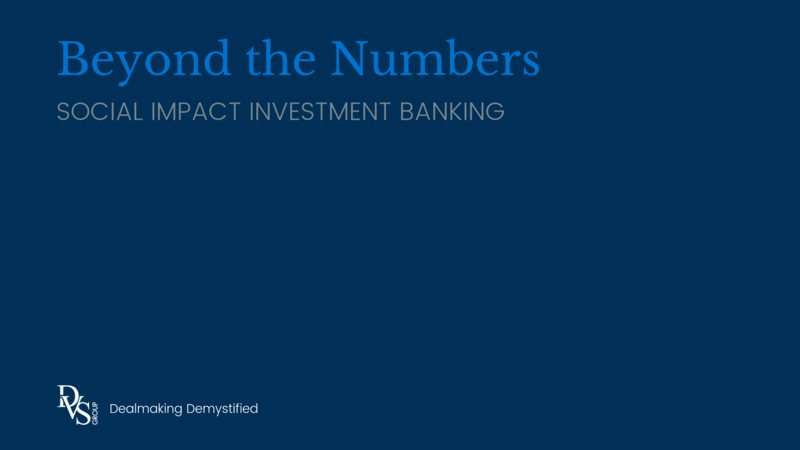 Social impact investment banking is thinking beyond the numbers to consider the people the deal will impact—and advising my clients to do the same. I rest easy at night knowing that my work as an investment banker at The DVS Group is providing real value to individuals, the businesses they serve and the communities they engage in. My team and I are making a social impact. Let’s take a look at social impact investment banking in action by examining three deals we’ve been involved in and the social impact they’ve had. 1. National Industries for the Blind. National Industries for the Blind (NIB) is made up of nonprofit organizations that serve blind and visually impaired community members. Two of our clients, Lighthouse for the Blind (LHB) in St. Louis and Alphapointe in Kansas City, are part of NIB. Along with education and support services, these organizations often provide employment opportunities. The manufacturing facilities for LHB and Alphapointe are equipped for a blind labor force. In fact, 90 percent of LHB’s labor force is legally blind. To serve and employ more people, LHB and Alphapointe used our buyside services to acquire privately-held businesses. LHB acquired TearMender (IL) and RapidFix (MI). Alphapointe acquired Proformance Calling (MO) and Matchless Molding (TN). Because of the revenue these acquisitions created, LHB and Alphapointe have improved their endowment return, supplied more job opportunities for their community and increased funding for their education and support services. Few nonprofits pursue acquisitions of for-profit, privately-held businesses. Yet, it’s easy to see that these deals have made a social impact. 2. Blue-Chip Executives. The DVS Group was founded to cater to the underserved community of blue-chip executives ready to apply their management and operations expertise to the role of business owner. My business partner, Kevin, found these individuals across the country as he spoke for the Ewing Marion Kauffman Foundation and Right Management. But he couldn’t find a service to connect them with businesses to buy. So, he founded The DVS Group and developed our proprietary deal search process to bridge the gap. Since then, we have helped blue-chip executives from all over the country become business owners through acquisitions. These deals are especially meaningful because we get to see the American Dream come to life as these individuals take on the challenges and rewards of business ownership. My favorite part is knowing that the social impact doesn’t stop with that individual. It spreads to the owner’s family, the business’s employees and the community those people are part of. That one deal has an exponential impact. Business owners who are conscious of the intangible goal of social impact, of taking care of their community will choose their buyer by considering fit more than price. That may mean receiving a smaller check at closing. Sound crazy? We’ve seen it happen. For those sellers, the reward of seeing their legacy honored has been much more satisfying than a bigger wallet. By it’s very nature, investment banking has massive social impact. Like many things in life, it’s not just what you do, but how you do it that makes the difference. We don’t just get deals done – we get the right deal done in the right way. We always think beyond the numbers because money matters – it’s just not the only thing that matters.